Memoirs of a Psychologist: The Psychology of Money and Adults - When Does Money Matter Too Much? Money matters - sometimes a lot. Sometimes it matters too much. I was raised in a family where money was emphasized and there was a "correct" path to success in life - you graduate high school, go to college, get a good job, save your money and eventually retire. But what happens when life has other plans for us? If our plans don't work out exactly as we expect, does that make us a failure? If we don't have a job earning us a 6-figure salary, are we doing something wrong? This post seeks those answers and more. 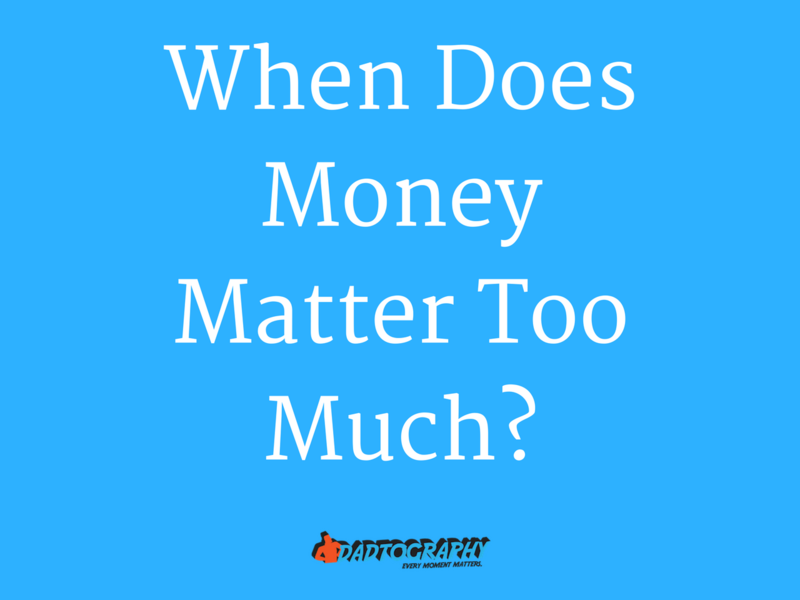 When does money matter too much? After a bit of a hiatus, guest author Dr. Robert Erdei has returned with what I feel is his best (and most relevant) post in the series yet: "Memoirs of a Psychologist: The Psychology of Money". In it, he examines the psychological aspects of money as it relates to men, women and children and help to explain why we act the way we do around (and because of) money. I'd love to hear your thoughts on any of the points made in the comments. Below is the first part in the series, "The Psychology of Money and Adults". Money is part of our everyday lives, without a doubt. Many of our thought and concerns revolve around it; therefore, it makes sense to think about it psychologically as well. Money is a tool, which enables us to get what we need or want, at least by public opinion. However, money cannot be considered as a „tool” in a sense that it has no specific quality and is not associated with a single job or some well-defined jobs. Take, for example, a hammer. It is a tool, but it has certain specific uses and you cannot solve a variety of tasks with it. In that sense, money is more universal compared to other tools and might be seen as a resource. Money is not as direct as other tools. The aforementioned hammer’s use does not depend on what others think about it. Money is different. Unless other people think it has some value and can be exchanged for other things, it is just paper and ink, and marginally valuable metal. Money is a method to control the social environment and it enables us to be less controlled by the social environment, e.g. being less dependent on others’ goodwill and social approval. Money allows the individual to use the social system and force the system to satisfy the individual needs according to Baumeister (2008). Use code DADTOGRAPHY and save $10 off your order! 1. Not part of the essential nature of someone or something; coming or operating from outside. 2. (of a muscle, such as any of the eye muscles) Having its origin some distance from the part that it moves. Adult’s views of money depend on their socialization, according to another study by Lau (1998). Lau compared two distinct professional groups, namely schoolteachers and business professionals. Teachers tend to be more concerned with human development, while business people with capital development. Lau also included a sample of students to the research. Both schoolteachers and students rated money lower on goodness, honesty and interest than business professionals did. Students attributed much lower power to money than schoolteachers did and businesspersons did. Students regard money as less important than adults who have direct experiences with it and are more aware of its practical need. Individuals who had higher preference for enjoyment, security and achievement perceived money as more important. Those who value extrinsic aspects of life, are more concerned with money, while those who accentuate intrinsic aspects regard money as less important. Sato (2011), in a more recent study argues that money is a device, which mediates social relationships, ranging from formal deals between buyers and sellers to deep intimate relations within families or between lovers. Modern psychological and economic theories doubt the rational choices of humans, therefore economic phenomena should not be regarded as products of rational choices, but instead of that a communicative act with the intention of creating meaning. The value of money is based on trust. People find it hard to destroy a piece of paper once they recognize as money from a foreign country. Adults have a distinctively different representation of money than children do. The practical function of money remains, but it is also an expression of social status, a means of power and in some instances, it can become an obsession for individuals. Couples where the female partner is employed are less satisfied with the relationship and report more communication problems. Women are usually considered as the treasurers of families on one hand, while on the other hand they are accounted to spend more money and make decisions about spending in families and cohabiting couples. According to the research results of Vogler et al (2008), this is not true. Couples recently have more balanced decisions about spending and greater equity is common among them. Despite the spread of equality, some inequalities still exist, according to the findings of Vogler et al. Females increasingly tend to have own incomes, which in some cases surpasses the male partners’. The role of money for males and females has been explained from an evolutionary perspective by some experts. Women are often accused of being materialistic and putting too much emphasis on money or earning potential of the partner. If we consider money as a resource, it puts things into a different light. The long-term mating strategies of women focus on the finding of a partner who is willing and able to commit resources for themselves and their children. The parental investment of women is far greater from a biological point of view (just consider pregnancy or the early years with a child, for example). According to the limited ability to produce resources, women consider partners who are able to produce the necessary resources and protection. Baker et al (1996) highlighted the traditional family structure of breadwinner/homemaker replaced by a dual-earner couple after WWII. They suggest however that couples where the female partner is employed are less satisfied with the relationship and report more communication problems. Despite these problems, employed married women feel more valued for their family contribution. Employment, and consequently a woman's own income, has a positive effect on the well-being and mental health of women as long as the demands of work and family life do not lead to an overload. Women are still considered as gatherers; they are less likely to be competitive and more likely to share and are more cooperative and democratic. Both genders were raised by women and females do not have rigidly separate from the model they are used to. Women are more likely to want to keep certain amount of money separate, despite sharing spending decisions. Men use money as a method to control women and subsequently control the relationship. However, control and power are not compatible with intimacy. A possible explanation of the difference in valuation stems from the personality of genders, with men being more competitive than women and this kind of competitiveness reflects in the valuation of money as well. Lynn (1993) found that these assumptions are true, regardless of the country of origin. Vogler et al (2008) claim that the traditional breadwinning role of males has faded. Regardless of gender, the decisions made about spending autonomously result in less satisfaction with the relationship compared to couples who make joint decisions. The theory is that men use resources as a way to attract women; therefore, money is important from the perspective of an evolutionist. Males had different challenges to master during the million of years of evolution. They were concerned with the uncertainty of paternity and consequently, misdirected "parental investment" (ie: paying for children they did not help conceive). Their mating strategy focuses in the long term on the finding of a partner, who has good parenting skills, commits for a long term and ensures the certainty of paternity. In some instances, men use money as a method to control women and subsequently control the relationship. This kind of control often happens through sexuality and reproduction. However, control and power are not compatible with intimacy. As Williams et al (2010) noted, men may be valued more than women not just in terms of salaries, but in other finance-related areas as well, like insurance rates, damage decisions awarded by juries or death benefits paid to survivors. Money is a masculine thing, according to some feminist researchers. Despite being raised mostly by women as well, men need to separate from women psychologically to be able to fulfill the roles society expects from them. Their previously described competitiveness underlines this kind of separation. Men are hunters, not gatherers, they are less likely to see the need of cooperation and can be offended when they go home with a new car and their wife complains about lack of consultation about spending. Both genders are characterized by somewhat different approaches to money and financial issues and decisions. These differences can have an influence the child-rearing issues, as the couple might have alternative ideas about what and how to teach children about money. Individual and cultural effects can result in great variance, and no two family or couple is the same and has the same problems regarding money. The most important question is to find equilibrium, which is acceptable to all concerned. One of the greatest risks for children who experience divorce may be that they learn it as the sole solution to marital problems. Psychologist Dr. Robert Erdei weighs in on the effects of divorce on men with this newest piece in the “Memoirs of a Psychologist” series. Another great piece from Dr. Robert Erdei writing about one of his passions and specialties: Raising Resilient Kids After Divorce. How do children of divorce survive and thrive? Psychologist Robert Erdei weighs in with some pre-teen parenting challenges and tips for getting to know your son or daughter. Memoirs of a Psychologist: Help for Parents of Defiant Teens: Part I – Is My Child Defiant? Part I in our “defiant teens” series: Help for Parents of Defiant Teens: Part I – Is My Child Defiant? Psychologist Robert Erdei sheds light on a common problem. Dadtography.com presents another guest post from Psychologist Robert Erdei where he helps parents deal with pre-teen behavior challenges and solutions. Memoirs of a Psychologist: dealing with childhood obesity – how to identify symptoms, risks and prevent our children from becoming overweight. Psychologist Robert Erdei tackles the tough topic of bedwetting (enuresis) including diagnosing the condition, explaining the causes and solutions. An overview of Asperger Syndrome in children by Dr. Robert Erdei including symptoms, diagnosis and what to expect if you suspect your child has Asperger Syndrome. Another great Memoirs of a Psychologist piece is for parents: Selective Mutism in Children. What are the causes, treatments and what to expect. What do you think? When does money matter too much to adults? Do you struggle with money issues? Leave a comment below!